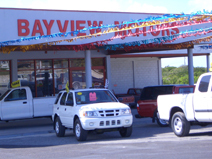 Bayview Motors opened operations in February 1997 as the first and only automotive dealer in the Turks & Caicos Islands. Initially selling Toyota, Daihatsu and shortly thereafter Isuzu, the dealership consisted of a showroom and 4 bay service garage. With Isuzu's switch to strictly commercial vehicle production and their imminent withdrawal from the consumer market, Bayview knew they needed to bolster their product lineup. With Isuzu gone, they then became a sub-dealer for Hyundai in 2004, and began selling select Ford models in 2006. Bayview then started to break ground for building expansion and minor renovations to the showroom. In 2007, sister company NAPA Auto Parts opened their brand new facility adjacent to the Bayview Motors showroom. Bayview moved their Service Department over to the new NAPA facility and became an authorized NAPA Auto Care Center. The repair center expanded to now include 7 service bays, while the body shop settled into the vacated service garage. Bayview's new vehicle showroom was connected to the new NAPA building and additional showroom area and office space was added. A paved forecourt was also created to display new vehicles, while an underground parking garage was constructed to house additional inventory. Suzuki was then added to the rapidly expanding product lineup in 2010, offering customers even more of a selection from a brand recognized the world over. In 2012, Bayview Motors became an authorized dealer for EZ-G-O and Cushman golf carts and utility vehicles, paving the way to electric, street legal hybrids and light duty commercial vehicles at an affordable price.